If you want a sketch from Jim Lee, chances are you'll want one of these two characters. But which one? Decisions, decisions...Well, why not both! That's exactly what he did for this year's annual San Diego Comic-Con charity auction. 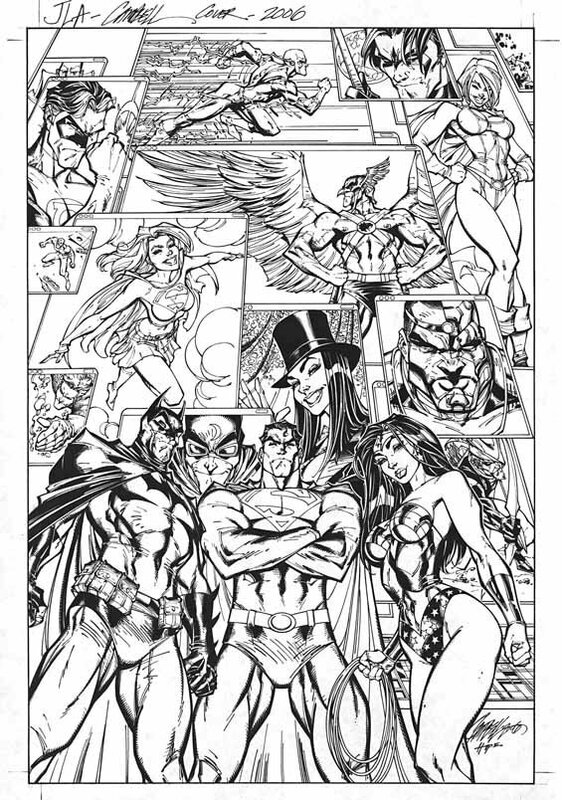 Plus, it was done completely in ink for all those original art collectors keeping track out there. The piece also went for a hefty sum, which benefits their handicapped services and deaf interpreters. 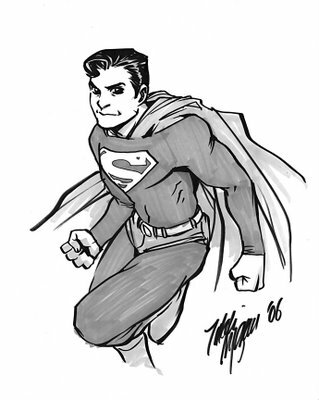 Stop by and say "Hi" and if you're lucky, maybe you'll see Jim drawing a Batman sketch! 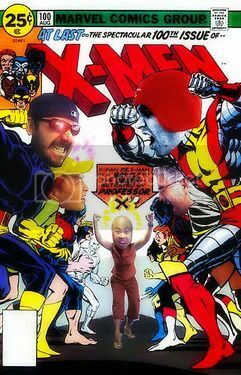 Or Wolverine! Or both! Unfortunately, I won't have any Gelatometti Sketchbooks for sale at the show, but please feel free to contact me and I'll get back to you as soon as I can. JUSTICE LEAGUE OF AMERICA #1 just hit stands and joining Brad Meltzer and Ed Benes on this title is our own Sandra Hope! 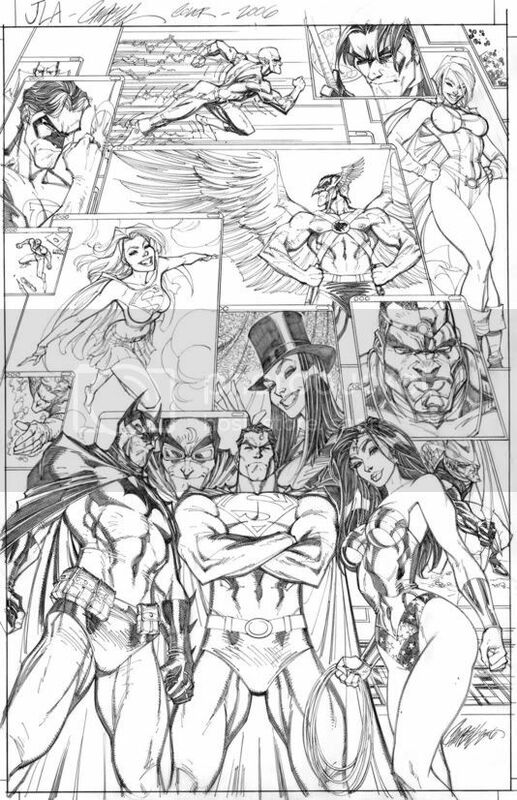 Before inking Ed though, she worked on this JUSTICE LEAGUE OF AMERICA #0 variant with WildStorm alum J. Scott Campbell. Brad's IDENTITY CRISIS was a favorite of mine, so it's great to sneak a peek over Sandra's shoulder to find out what's coming up next. 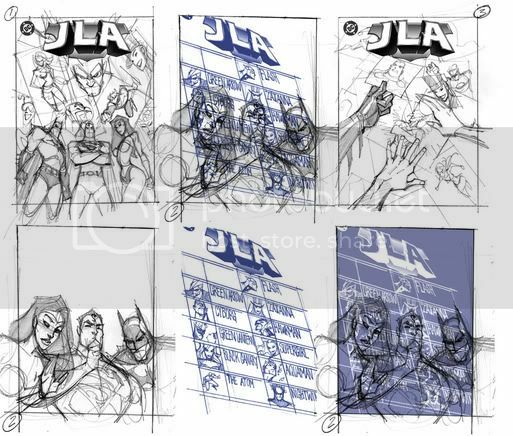 You can also see the whole creative process from thumbnails, pencils to colors too. 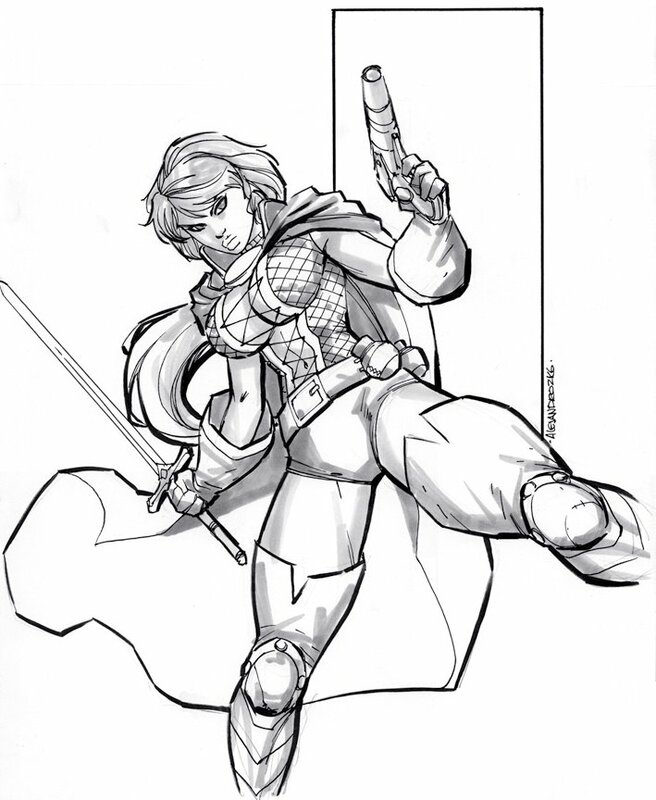 Here's another one of Alé's commissions from Wizard World Chicago, this time showing Skye Runner ready for action! 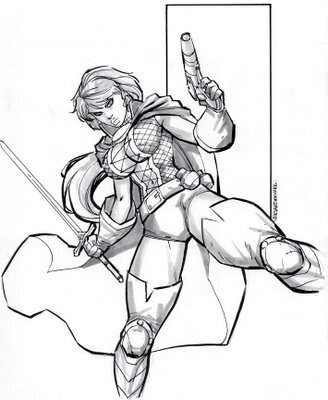 IIRC, the other characters Alé drew were Padmé Amidala, Hellgirl, Lady Rawhide and Grace. Thanks go out to Demian for not only sending in the scan, but also for being so patient at the con too! This November, Brian Azzarello and Carlos D'Anda bring Michael Cray back from the dead and into comic book stores again. It's been awhile since he's seen some action, but leave it to these two to put their stamp on him in today's current geo-political climate. And both creators share a little history with him too. 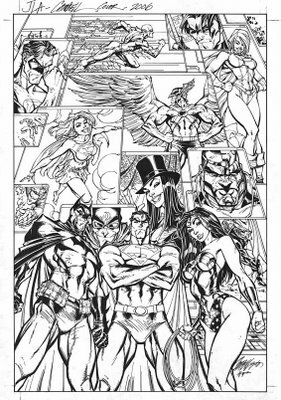 Previously, Azzarello wrote him in the three-part BATMAN/DEATHBLOW: AFTER THE FIRE and D'Anda's been itching to draw Cray again after a short story in 2004's WILSTORM WINTER SPECIAL. But consider both tales a warm-up to what they've got in store for WildStorm's favorite Navy SEAL. D'Anda's inks are pictured above and you can also check out the final colors here. The idea on all the covers is to symbolically use Deathblow's trademark red lines to constantly remind him of who he's doomed to be too. 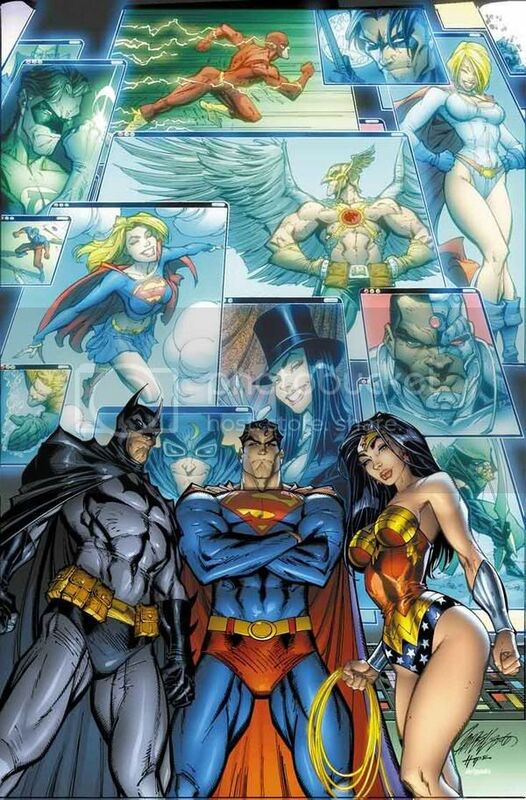 Continuing the cross-company concept (try saying that three times fast), here's a triptych by Ryan Benjamin teaming up the WildStorm Universe with a couple characters from DC. 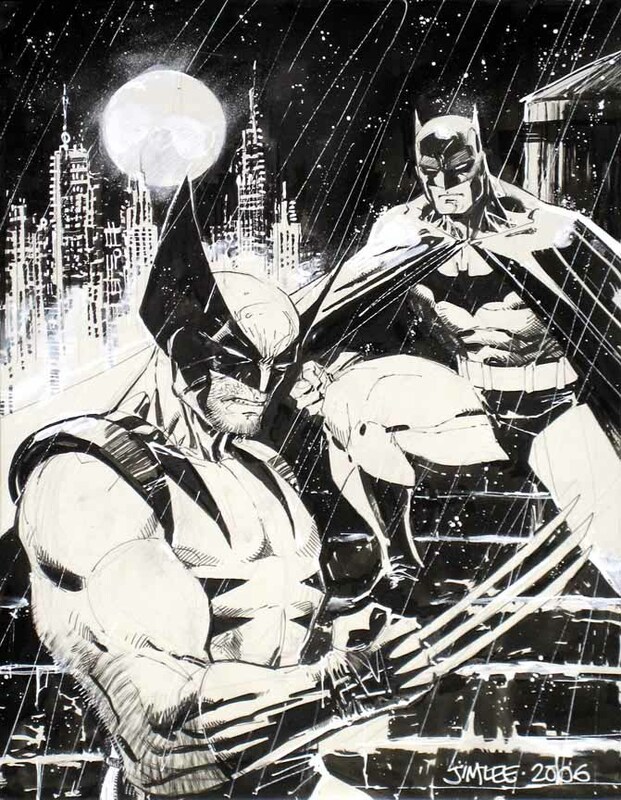 This piece started off as a single 11" x 17" board with Batman and Deathblow and quickly grew into a full-blown assault team as Ryan got a chance to draw his favorites from both companies. Gotta feel sorry for whoever they're hunting down! Thanks to everyone who ordered a Gelatometti Sketchbook! I just came back from the Post Office, so the first batch is already on it's way across the globe! They also have these new DC Comics Super Heroes stamps, so I put one of those on each package too. Isn't it wild how super heroes are becoming so mainstream these days? 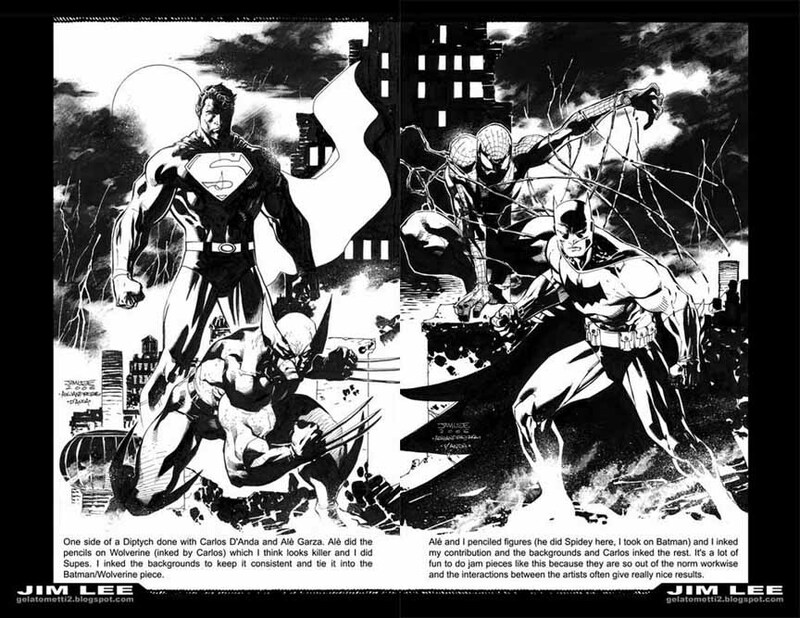 Above is a double-page jam by Jim, Alé and Carlos. Can you tell who drew which character? You can find the answer by clicking the image and reading Jim's commentary on the piece. And that's just two of the sixty-four pages inside the Gelatometti Sketchbook! Next week, I'll also have some more new pics for the blog, so until then, as one Gelatometti fan put it, "it's back to saving the world." BECAUSE YOU DEMANDED IT! The first ever Gelatometti Sketchbook is now available for sale! The sketchbook craze has been going on for the last several years at comic conventions, so everyone was excited to jump right in with this one. 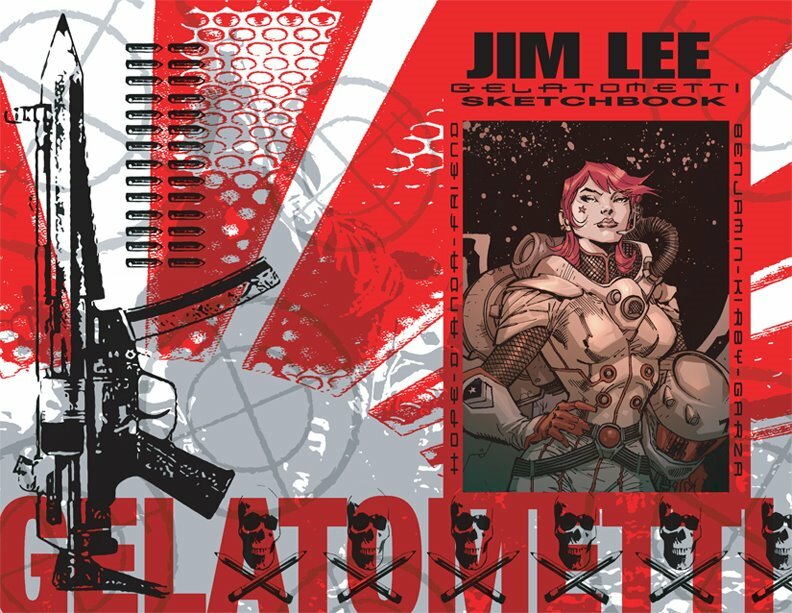 It's sixty-four, glossy pages of Jim Lee, Ryan Benjamin, Carlos D'Anda, Rich Friend, Alé Garza, Sandra Hope and JJ Kirby all in one handy, ashcan-sized sketchbook. Speaking for myself, it's been fun to see this little collection of art come together in the short time I've been at the studio. Some pieces I've seen from start to finish, while others I saw for the first time in the sketchbook. But don't let me spoil it anymore for you. 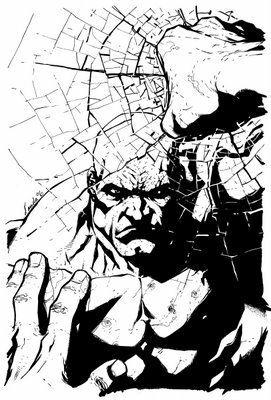 A limited supply of last year's PH4 Sketchbooks featuring art by Lee Bermejo, Carlos D'Anda, Rich Friend and Alé Garza is also available, so please let me know if you'd like one of those too. Plus, Ryan Benjamin has a new sketchbook on his website, including preview pages and even a sketch with each one! $1.00 - Extra S&H for each additional copy and you can also buy as many as you'd like. PayPal, money orders or checks are acceptable and payments made by check will be sent after the money clears. Finally back up to speed after coming back from this year's Wizard World Chicago. I don't think I've missed one since '98, so it's definitely a familiar show for me, but this was the first time I was gonna be set up in Artist's Alley selling sketchbooks. Besides the Gelatometti one, I also had sketchbooks by Ryan Benjamin, J. J. Kirby and Leinil Yu for sale too and they were consistent sellers throughout the con. 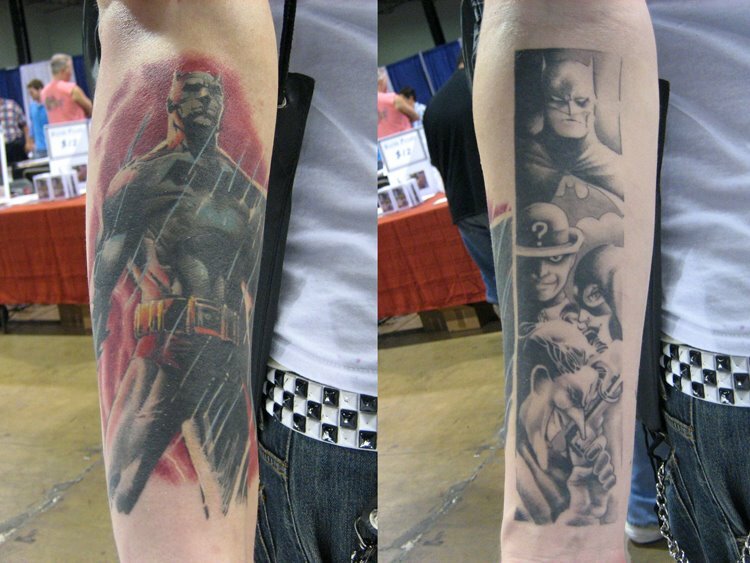 Thursday night, I saw this guy walking by with a crazy tattoo of the last page from Batman #619, so I had to get a pic. 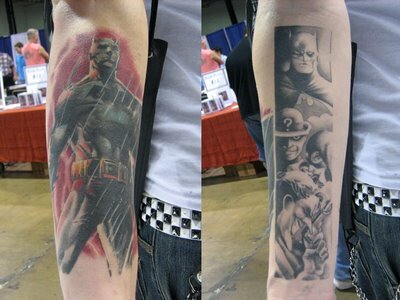 It's not everyday you get to see one Batman tattoo, let alone two on the same arm! Now, that's a die-hard fan! The next morning, I took a little time walking around the show and picked up some cheap Captain Carrot comics for J. J. and some more Michael Golden comics for myself before sitting back down in Artist's Alley. Mark Brooks was on my right and Eric Canete, Dustin Nguyen, Joe Dodd and Francis Manapul were all to my left, so it was great to watch 'em all in action. It's definitely a little different being behind the table selling sketchbooks, instead of being a fan buying them, but it's always fun to meet people from the blog and talk about what's new at Wildstorm. Saturday was definitely the busiest day of the con and after selling sketchbooks for a few hours, I headed up to the Sam Loeb Art Auction to check out all the action. 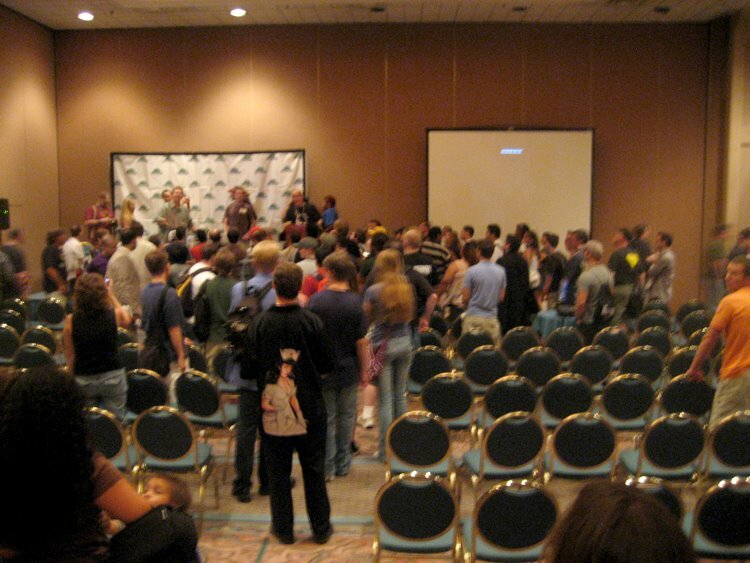 By the time I got over there, it was standing room only with even more fans pouring out of the two side doors. I quickly ducked in and caught the end of Jim and Scott's Superman/Batman #26 double-page spread selling for a whopping $7,000. Jeph Loeb was up at the podium auctioning off all the pieces himself, along with an energetic Erica Durance (Smallville's Lois Lane) in her only appearance at the con. Everyone really opened up their wallets for all the art too and as soon as the panel ended, half the audience rushed the podium with the hope of getting Erica to sign something or just snap a pic of her before she left the show. Mark also invited Takeshi Miyazawa to share his table, so I got to watch him draw sketches non-stop for fans, including myself. It was the first time I'd ever met him, but Alé's been talking about Spider-Man Loves Mary Jane at the studio and I've read a couple of his issues on Runaways, too, so I picked up my one and only sketch at the con from him. 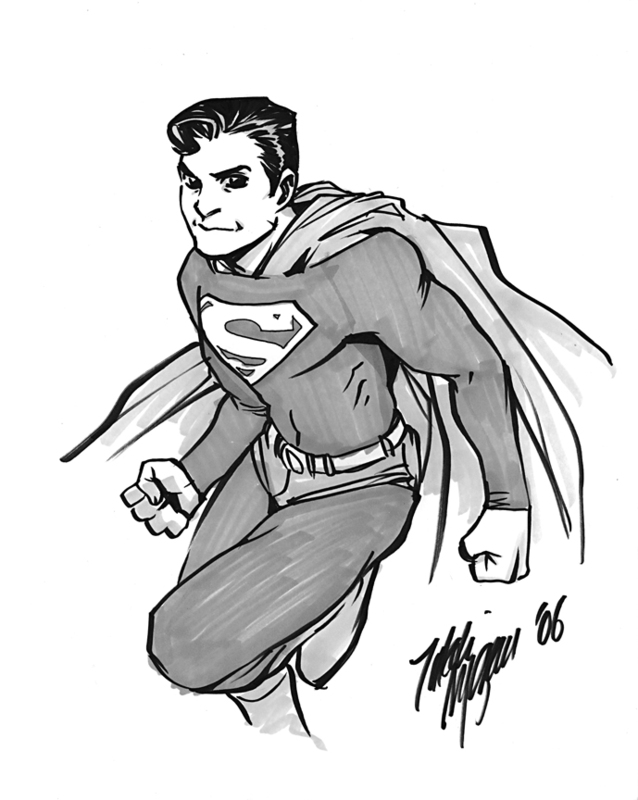 He usually just draws characters he's already familiar with, but fortunately, I brought along some reference of DC's Man of Steel to add to my collection. I also brought along Alé's commissions for some happy fans, but this piece was the only unclaimed one that came back home with me. If you're still out there, drop us another line and we'll try to get it out to you. By the end of the con, I'd sold a bunch of sketchbooks, said my goodbyes and crammed all my new quarter comics into my bags. I bumped into some friends at the airport later and shared a quick dinner before leaving the Windy City for another year and heading back to sunny San Diego. For fans who couldn't make it out to the show, please check back this weekend to find out how to get your own Gelatometti sketchbooks and thanks again to everyone at the show!